Let’s meet for a latte? My little Sister, Trisha found her way West. She settled in Kelowna, British Columbia, where life is beautiful. I don’t get to visit all that often due to the hefty distance to fly across Canada, it’s from the Atlantic to pretty much the Pacific. Trisha and I have a lot in common, from our up bringing, to the love of wine country. Trisha loves cats (a lot of cats) but she has flirted with a dog. I love dogs and have cared for Mom’s cats. 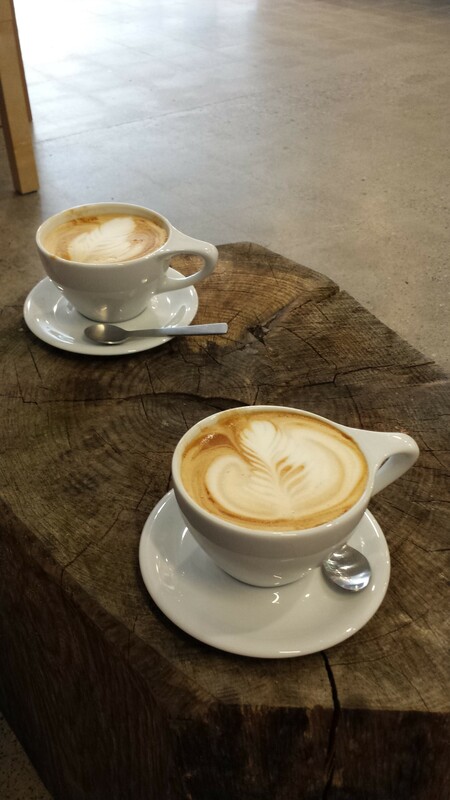 One thing we love to do, is find a time to chat over a latte! Trisha: Hi, What’s up? I can drive up Westside Road to the Resort to pick you up around 11. Will you and Hubby be ready? Mo: Sure! But I can drive you know. Why not meet down by the Lake? Trisha: Nadda. You don’t know how awful that road is, and you are likely to get run off the bank. Hubby: Tell your sister she doesn’t have to do all the driving. We don’t mind. Trisha: Tell Hubby to keep his shorts on. I am grown up at 51, I will pick you both up at 11. Hubby: Why not go somewhere normal like Vernon? We can go to Kelowna tomorrow. That way we can avoid that drive down Westside! A couple of hours later, we were all moseying down the road in Vernon. It was July and it was hot. We found a reasonable café and we all said, “want a coffee?” Zip- we were in the Café. When you come from the East Coast of Canada, you don’t know the majesty of trees like you do in BC. Our trees are shorter than BC’s totem poles. BC takes every opportunity to show off the prominence of their forests. Even with their café tables! Trisha: So Mo, what do you think of today’s latte? Mo: Slurp. Ummmm. Sweet! Its just nice to rest my feet, so the swelling goes down. How about you? Does it meet your fancy? Trisha: It is a nice cup, but I should of had a double shot. My back is nothing but trouble, I didn’t sleep last night. Hubby: You have to pace yourself, Tiss. We can beat the trails and meet up later? Trisha: I am pretty sure that I can keep up with my big seester. (Fun snarl) She just thinks she can out walk me! Mo: (Eye brows raised.) Slurp. Trisha: It’s true! I am doing fairly well post the cortisone shot. But, I will take it easy. How were the Kootenays? Mo: Sis, I get how peaceful this place is. It is like heaven on earth. But really, these forest fires. I would rather the rain, drizzle and fog. I mean, the other morning in the Kootenays, I turned over at 7 a.m. in the morning and I started to realize it was like I was in M.A.S.H. or something. That woke me up! I just knew a fire musta broken out close by. I timed it. I was lying in bed, catatonic! Every four minutes, a chopper flew over the house. Every four minutes! At the time I thought it was one chopper. 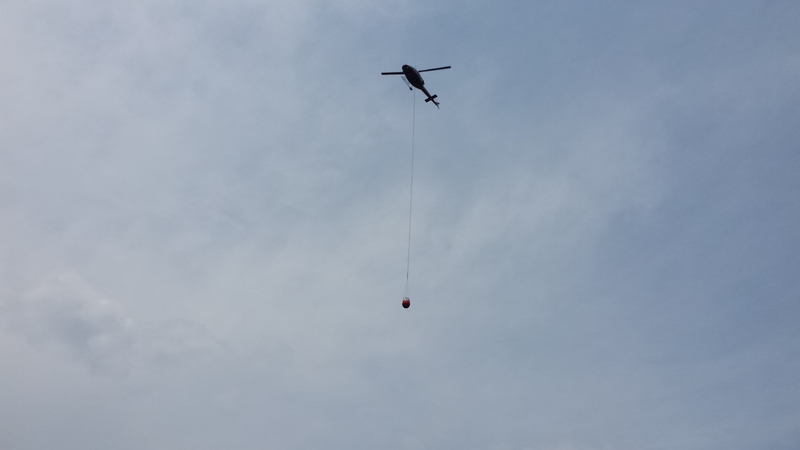 That would be 1.5 minutes to fly down the hillside, one minute to dip the bucket and 1.5 minutes to fly back to the fire. Scary! Trisha: Okay Mo, deep breathing, remember. Mo: (Breathing in through my nose and out through my mouth. Focusing on the stomach not the chest. Crap I can’t figure out how to breath through my stomach! Grrrr, my lungs are behind my ribs.) Slurp. Good Latte? Hubby: Yah. Mo picked the place. She was on vrbo.com for two weeks. She was down to two spots. 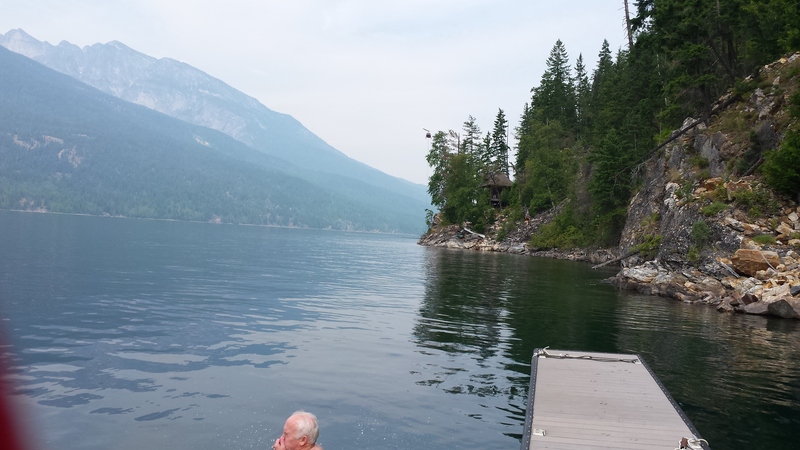 She said one looked so quaint, but she decided on the one overlooking Slocan Lake. She came to the conclusion the other one was haunted. She said it reminded her of a book she read where a person was murdered. What was the book? Mo: The Shack. Thanks for reminding me. That really helps, I’ve gotta say! Trisha: Haha. Nice café, don’t you think? Hubby: Did you say there was Croc farm close by? Trisha: Yep, Hubby. It isn’t too far from here. I think you’d like the guy. Your type really. Reminds me of your next door neighbour back home. Hubby: She is only mad because I was right. Mo: I suppose you want me to be wrong? 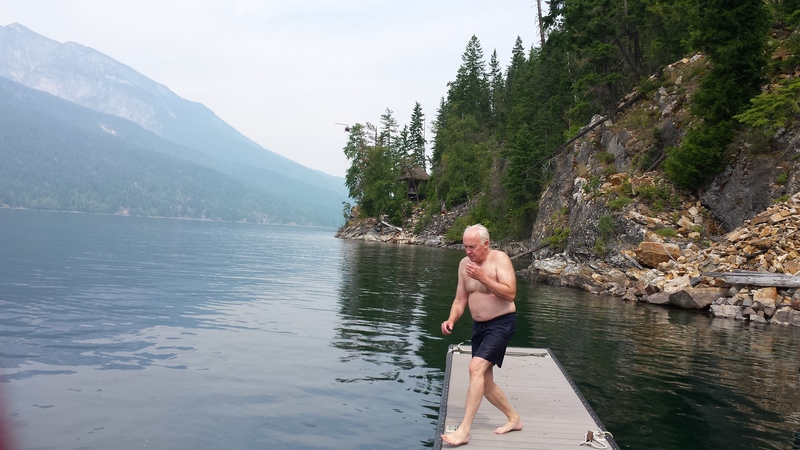 Mo: Anyway Hubby thought we needed to walk the 20 minutes down the steep hillside to the dock for our swimming day. Trisha: (Looking ridiculously hopeful and quite condescending) Now you would love that Mo. I bet it reminded you of the Lake in Litchfield, Maine. Mo: Oh yah, right! The only thing I had to worry about in Maine was the sunfish who spawned at the end of the dock and kept nipping me if I stepped off the rock in her direction! Mo: Alright, after breakfast I was better. If the pilots knew we were there, and if the fire got bad, I figured they would send someone or maybe warn us. Sigh, we went to the dock. It was nice, actually. 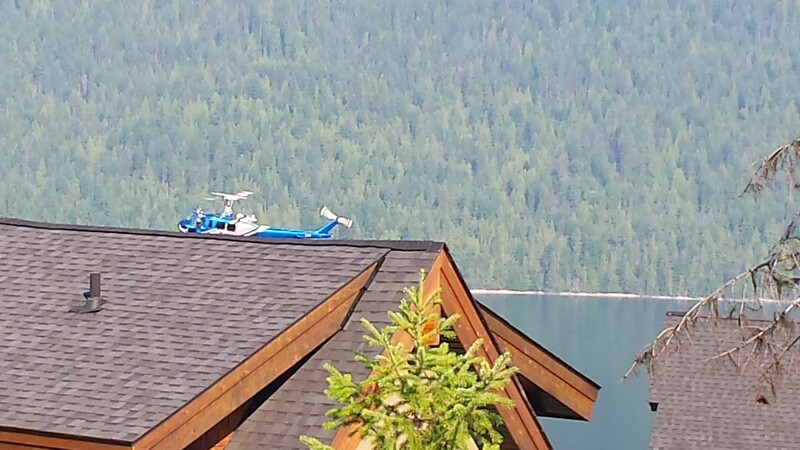 Hubby: The helicopter pilots even waved. We were fine. 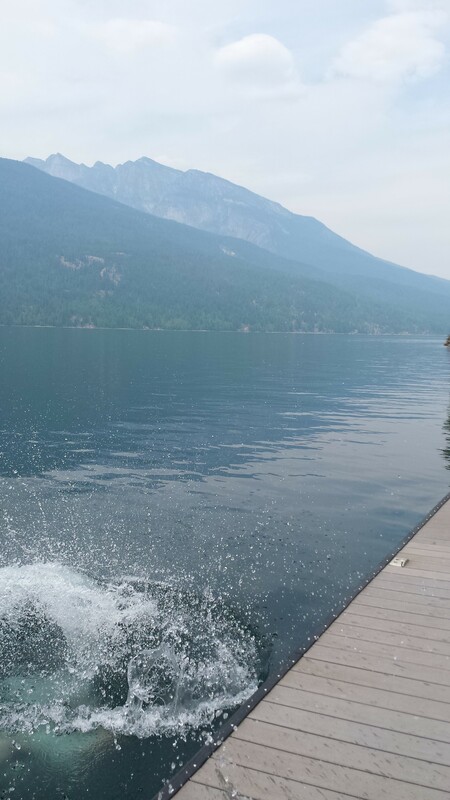 Mo: Hubby’s logic was that if the fire got to the Lake, (rolling my eyes this time), we just have to jump in! Like we could just wait and do that …. Trisha: Mo, that couldn’t have been much of a fire, by BC standards. Did you see anything? Hubby: No. We went to a great café in Silverton. I asked the guy who runs it what he thought. He said the fire was just across the highway and it is well contained. No worries. Smile Mo! (It was a demand, not sympathy) He made you the best latte ever. The one with the bear. It went well with the bear bells you wore all the time. Post script: In spite of the record forest fires around Kelowna, BC, and Washington State, we are headed back next year. I am picking the month of May! I will definitely wear my bear bells! 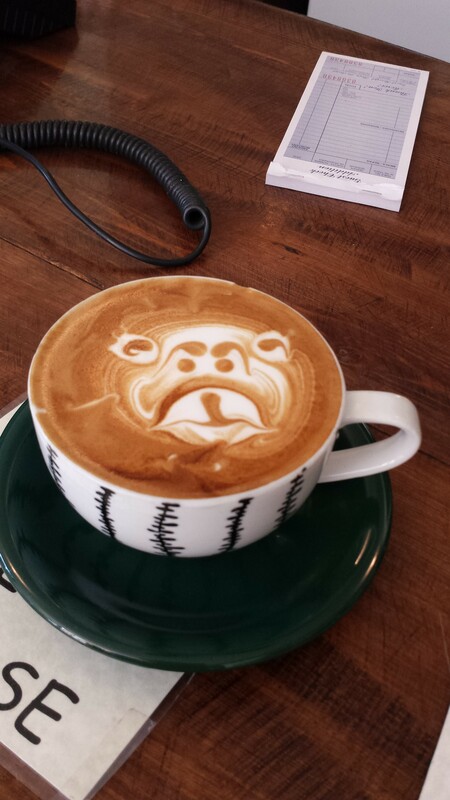 Gotta love bears and lattes, don’t ya think?